The first and foremost thing to understand about Traditional Conjure is that it is an African American magical system in its origin, and over time it has been influenced by Native American and European practices and folklore. However, it is important to restate that it is an African American traditional magic practice. catherine yronwode writes that the actual term Hoodoo came into use possibly in “the 19th century or earlier.” 2 It is important to note that Traditional Conjure is a direct descendent of Western and Central African magical practices brought to the United States with the slave trade (several hundred years prior). Often, my enslaved ancestors had to keep these practices secret or risk death. We were forced to convert to Christianity upon our arrival in the United States, and when finally allowed to make religious choices, many of us stayed in the Christian faith. Some of us continued the magical practices of our African ancestors in conjunction with Christianity. As a result, Traditional Conjure goes hand in hand with the Christian faith. That being said, there has been a lot of appropriation in Traditional Conjure. People who have not been properly informed, or choose not to take heed when informed, tend to do what they want to do as “the Spirit(s) lead them.” That is a personal choice, but it is to be understood that Traditional Conjure is NOT Wicca, Pagan, Witchcraft, Santeria, Haitian Vodou, New Orleans Voodoo (although NOLA Voodoo practitioners incorporate many elements of Traditional Conjure in their work), any New Age Religion, etc. Traditional Conjure is a practice within the African American Christian tradition. It is important that people understand that before diving into this work too deeply. It is often a deciding factor as to whether or not to pursue this path, and it is an extremely personal decision. As more people were more formally educated, they did not see this informal observance as teaching, and many Blacks lost the lessons of Conjure and how it relates to everyday Black life. As Starr Cassas has often said, “it was just what my mama did. We did not know it was Conjure.” She has also advised that it is a way of life. Once you are familiar with the rituals in the practice, you will see that Conjure finds its way into your housekeeping, cooking, how you treat illness, deal with relationships, and entertain people in your home. Before the days of websites and online groups, there was Traditional Conjure. Most people heard about local workers via word of mouth, and if you employed the services of a worker, it was deeply personal and kept private. It is not a surprise that within the tradition, workings are not put on public display, and if they are, their meanings are not freely discussed. It has been so integrated into the lives of my people so much, that it was assimilated into the culture, whether we are consciously practicing Traditional Conjure or not. Many Blacks still do not know that there is scholarly study devoted to the subject and online groups and classes devoted to practice. This is not to say that Traditional Conjure was/is not practiced by non-Blacks. That is simply not true. It has been, and always will be a practice that is open to anyone that believes in the power of God’s Roots. The following sections provide the two basic magical principles that guide the practice of Traditional Conjure. In Traditional Conjure, you see this in the use of Personal Concerns in the work. When you have something like a person’s hair, fingernails, spit, dirt from foot tracks, name, picture, etc. employed and included in work, your spell for or against them is much more powerful. It may happen faster, last longer, or have more intense effects on the subject. There is a hierarchy in The Law of Contagion. A working with someone’s hair is most likely to be more powerful than a working with simply a person’s name. The work becomes an extension of the person who is the rightful owner of their personal concern. This, while most likely the case, is not always the case. Remember the workers faith and magical abilities AND the faith and execution of the person requesting the work are also highly influential in the results. Based on this principle, work is practiced on a person, it takes uncrossing magic to undo the work. That’s the basic definition of The Doctrine of Signatures, but it goes a bit deeper in Traditional Conjure. It stems from the belief system that every root/herb has a spirit and a purpose. It may be the way the root/herb looks, smells, tastes, or the traditional use of it (e.g., roses for love, salt for cleansing) that creates its definition for use in Traditional Conjure. This practice also is not limited to roots/herbs. There are many curios used in Traditional Conjure that remain in the practice that are not roots/herbs, and some have even found their way into popular culture (e.g. the lucky rabbit’s foot or penny). The common names (or Latin translations) of the root/herb also have a big influence on how The Doctrine of Signatures was applied and implemented in Traditional Conjure. Often the names of the root had something to do with the smell or appearance root/herb. It is not hard to see how Wormwood, Devil’s Dung, Vandal Root are often used in jinxing workings in Traditional Conjure. It is VERY important that you apply The Doctrine of Signatures in your workings. You want to avoid using roots, herbs, and curios in ways in which they were NOT INTENDED in the practice. For example, Van Van conditioning oil is used for luck and blessings. Many people use it in candle work, mojo hands/bags, and floor washes. It’s most important herb in Van Van Oil is Lemongrass. Lemongrass is used for cleansing. You should NOT add something like Black Dog’s Hair (used in jinxing) to Van Van Oil. If things unrelated with luck and blessings are added, it is no longer Van Van Oil. Without Lemongrass, it is not Van Van Oil. This is not to say that another practice may not find these examples useful for blessing, but this is not so in Traditional Conjure. What you will find is that this makes Traditional Conjure easy to understand at its simplest level. As you delve into spiritual work, you will find that it gets a bit more complicated. That is why it is called work. Some baths take days and days. Some rituals require you to do things at sunrise or midnight. You may have to go to the graveyard to work with an ancestor. When you work with Ancestors and Saints, you will be setting up altars. 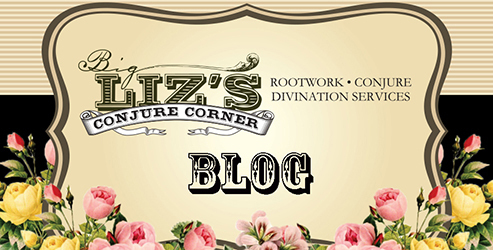 There are many things about Traditional Conjure that cannot be condensed into a simple definition, but it is being Soon I will be creating a Getting Started Reading List to help you find more resources for Traditional Conjure.